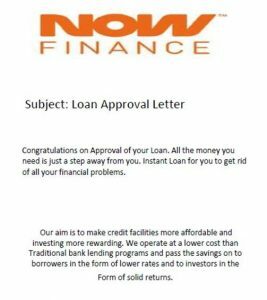 Email us at; customerservice@nowfinance.com.au or by calling 1300 275 669. Sender email address: this might be unusual, misspelled or slightly different from the correct version. Poor grammar and spelling: This can be a tell-tale sign. Suspicious links or fake websites: use your mouse to hover over the link to see the actual web address the link leads to – it could lead to a fake website. Sophisticated cyber criminals can also use other methods, such as sending SMS text messages in their phishing exercises too. These fraudulent text messages use the same tactics as phishing emails, so be aware. Our Compliance and Security team monitor this information so that we can protect our customers. If you receive an email with an attachment that asks you to open it, it might actually install malware on to your computer. Do not open these attachments. Simply contact us so that we may be able to assist you further. NOW FINANCE is aware of a current email phishing campaign. 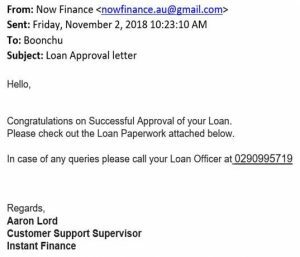 Emails bearing the NOW FINANCE logo are being sent suggesting recipients have been approved for a personal loan. The content of these emails contain poor grammar and contact details not belonging to NOW FINANCE. Please see examples below. Do not click on any links, or call the number listed on the email. Trust your gut, and if you are suspicious contact us directly on 1300 275 669.